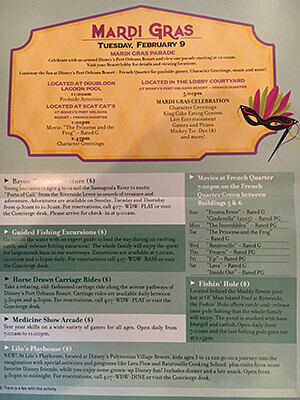 If you happen to be visiting Port Orleans during Mardi Gras there are usually lots of fun little activities around the resort and by the poolside which guests can take part in. 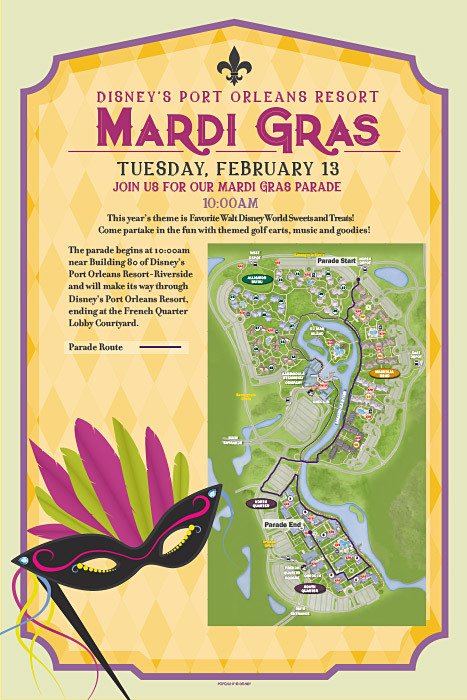 Look out for the signs, or ask at the front desk for information. 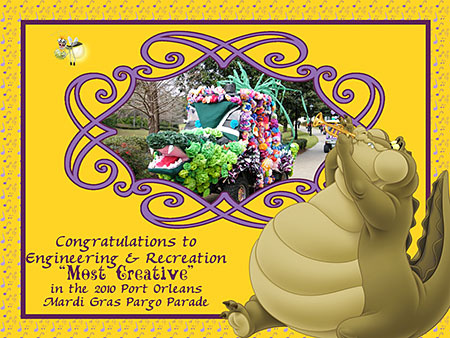 In 2010 for example, even though 16 February was rather cold there were afternoon pool side activities and games for the kids. 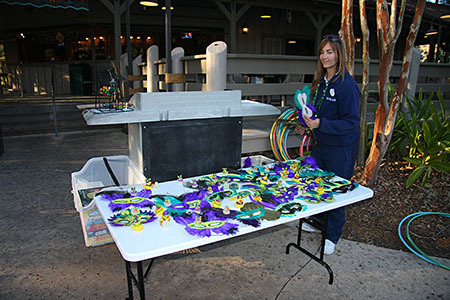 The cast members were giving away beautiful free feather-decorated masks and plastic Mardi Gras toys for all the kids who could successfully hula hoop. Of course, it was just our luck that my own nine year old daughter was feeling unwell that day and stayed in bed, as watching a slightly over-weight 47 year old dad trying to hula hoop for her prize probably wasn’t pretty! 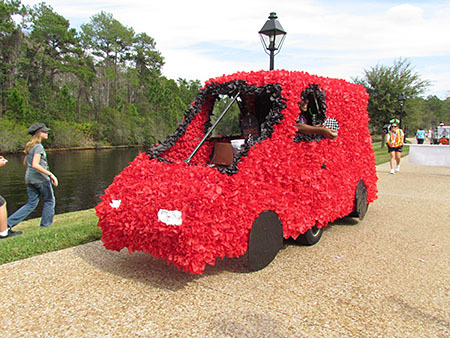 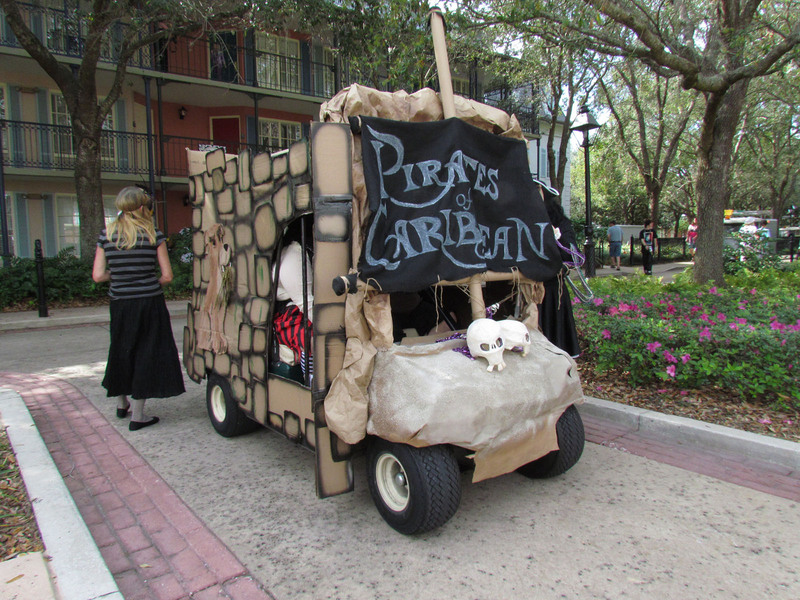 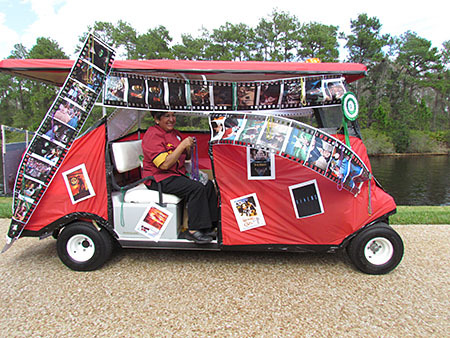 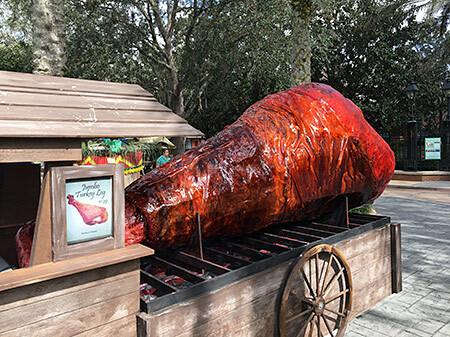 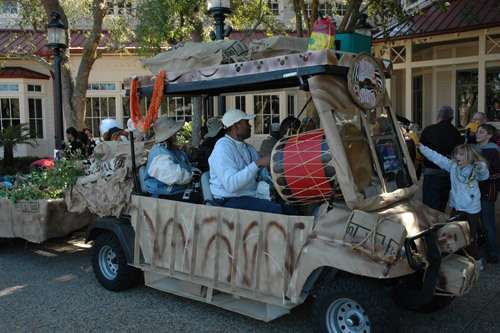 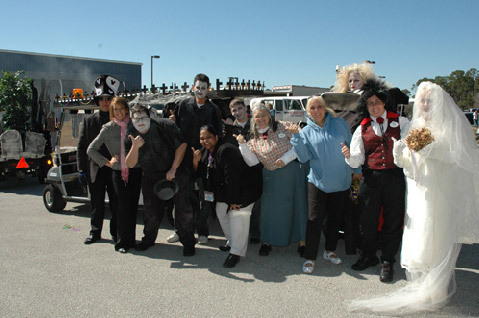 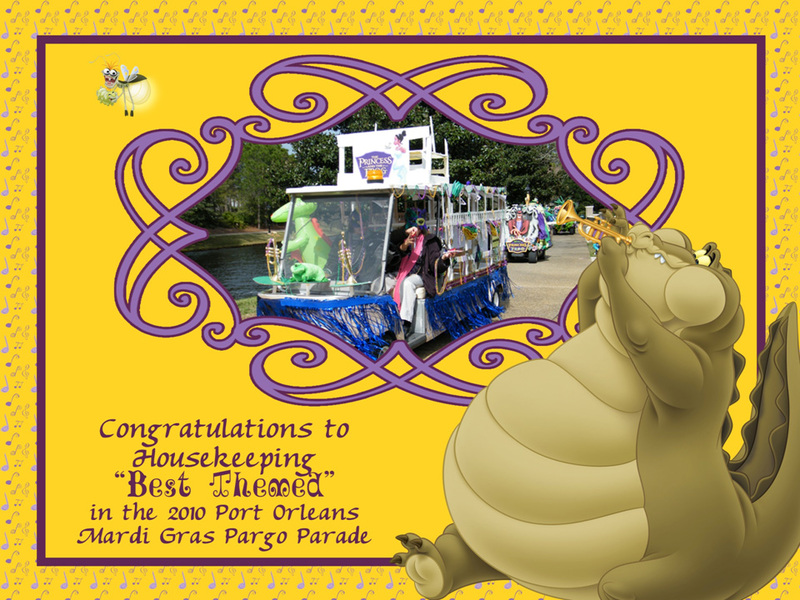 Every year, Port Orleans cast members get the opportunity to enter a competition to see which department (Front Desk, Housekeeping, Custodial, Food & Beverage, etc) can dream up the most creative, best themed Mardi Gras parade floats based around the resort’s “pargo” vehicles. 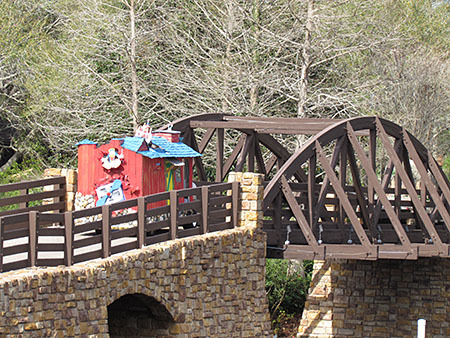 These golf-cart like buggies are normally used to ferry cast members, guests and luggage around the resort’s winding pathways, but it turns out that they also provide excellent bases for small parade floats. 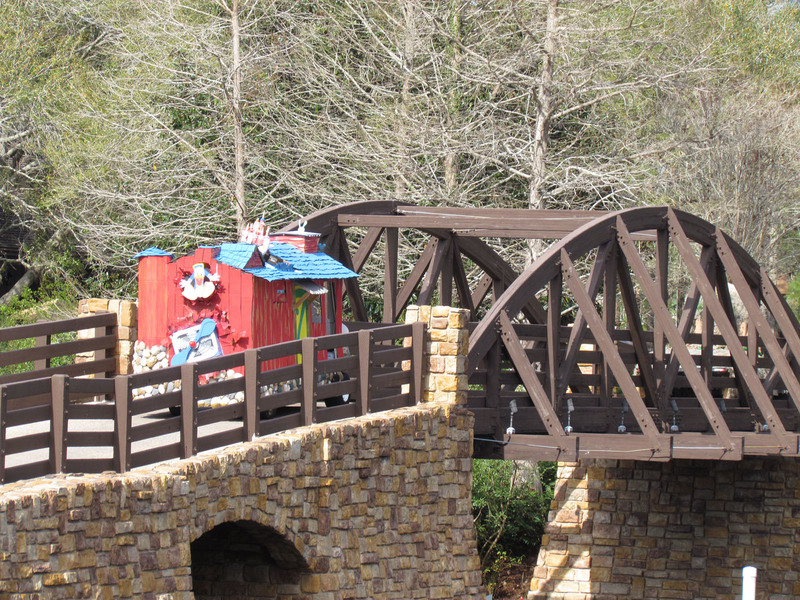 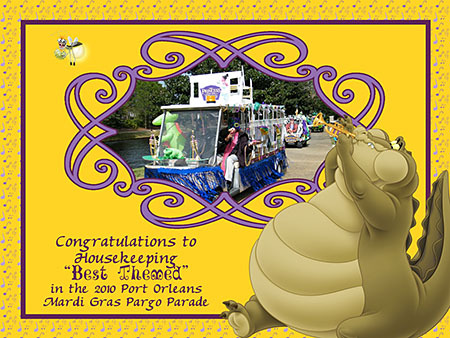 The cast members get to parade their imaginative floats around both resorts for guests to see on the official Mardi Gras “Fat Tuesday”, and for 2011 and 2012 it all kicked off from Riverside’s Acadian House at 1:30pm before doing a round trip through French Quarter and back. 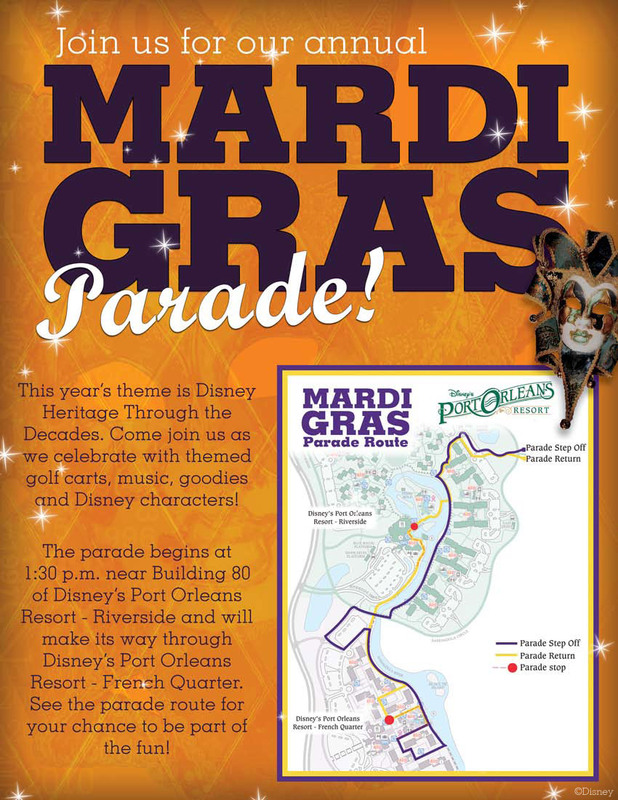 Disney’s Port Orleans Resort kicked off Mardi Gras in style Feb 5 with a Mardi Gras parade and float-decorating contest. 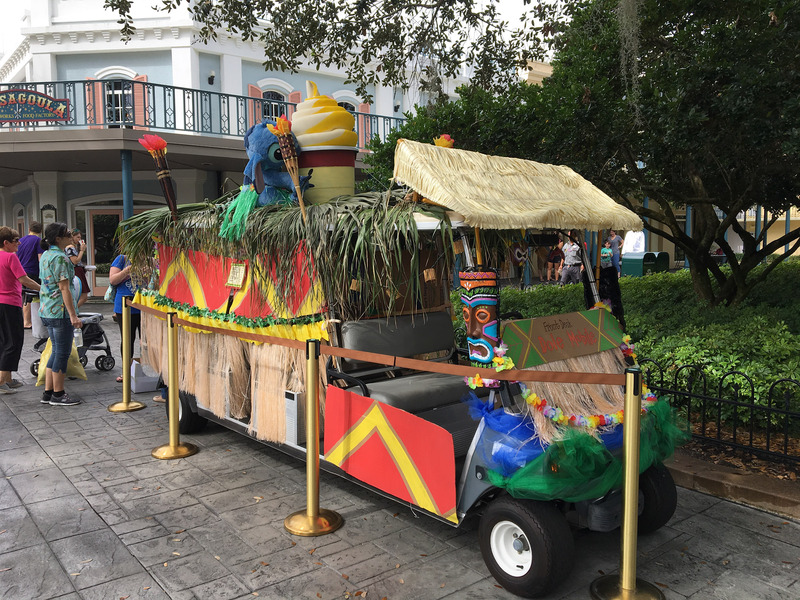 The parade and contest, which is a popular treat for Guests staying at Disney’s Port Orleans Resort, consists of Cast Member-decorated golf carts, that serve as parade floats. 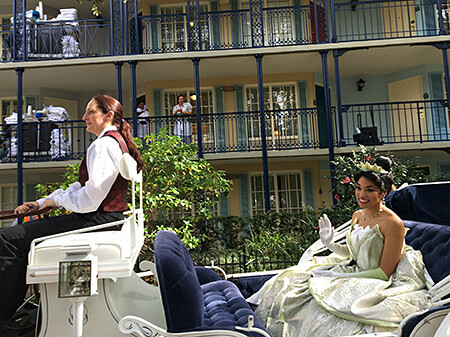 Prior to the parade taking to the sidewalks of the resort, Walt Disney World Ambassadors Clay Shoemaker and Vanessa Rosas presented awards for the most creative (Splash Mountain — decorated by Food & Beverage), best themed (The Haunted Mansion — decorated by Front Office ) and best all around float (Kilimanjaro Safaris — decorated by Housekeeping/Custodial). 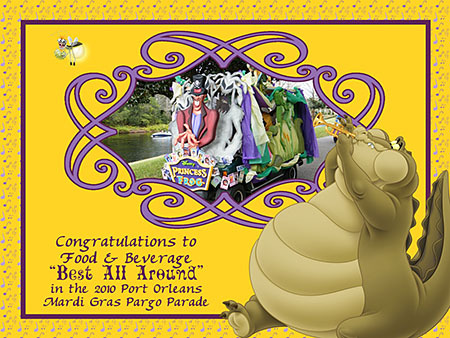 In addition to the parade, Cast Members also were treated to a Bubbalou’s Bodacious BBQ, a visit from Jester Goofy and Mardi Gras King Mickey Mouse, played Wii and Wii Fit, and had chances to win Magic Backstage prizes throughout the day including cooler chairs, duffle bags, plush animals and a 20-inch flat-panel screen TV. Here are the winning float certificates for the 2010 cast member Mardi Gras Pargo Parade at Port Orleans. It’s quite obvious that everyone puts a great deal of time and effort into these entries. 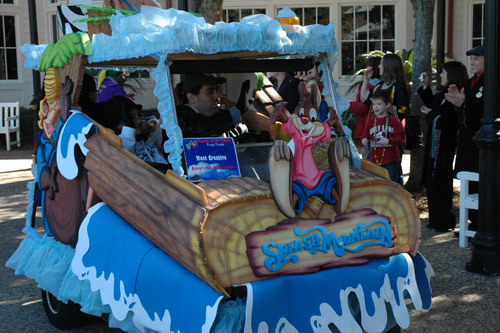 The 2012 parade theme was Disney Heritage Through the Decades, and it celebrated the 40 year history of Walt Disney World. 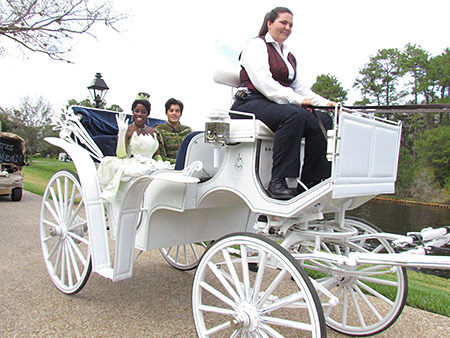 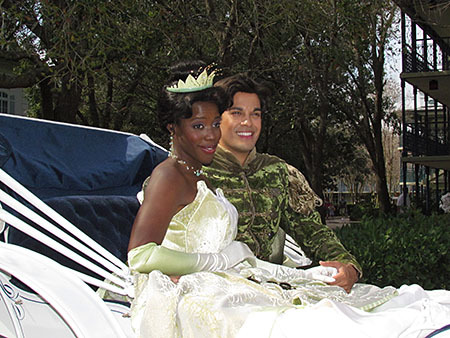 They even invited Disney Royalty, in the form of Prince Naveen and Princess Tiana from Princess and the Frog, who led off the event in a horse drawn carriage. 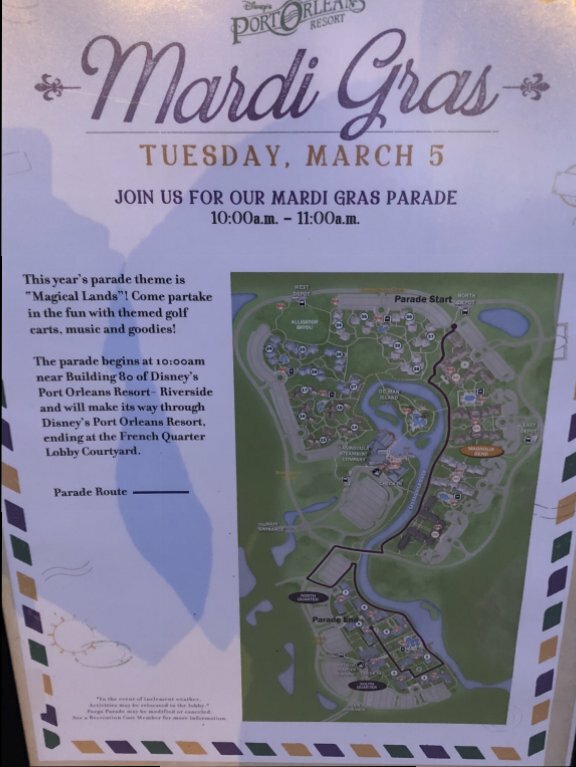 Starting at 1:30pm on Tuesday 21st February, the parade began next to Acadian House and worked its way alongside the riverbank over to French Quarter, then it headed back to the Riverside Mill and finally across Ol’ Man Island back to its starting point. 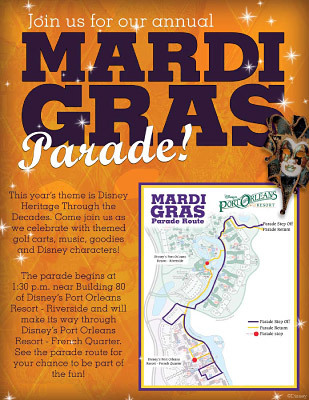 See the 2012 Poster for the the full route details. 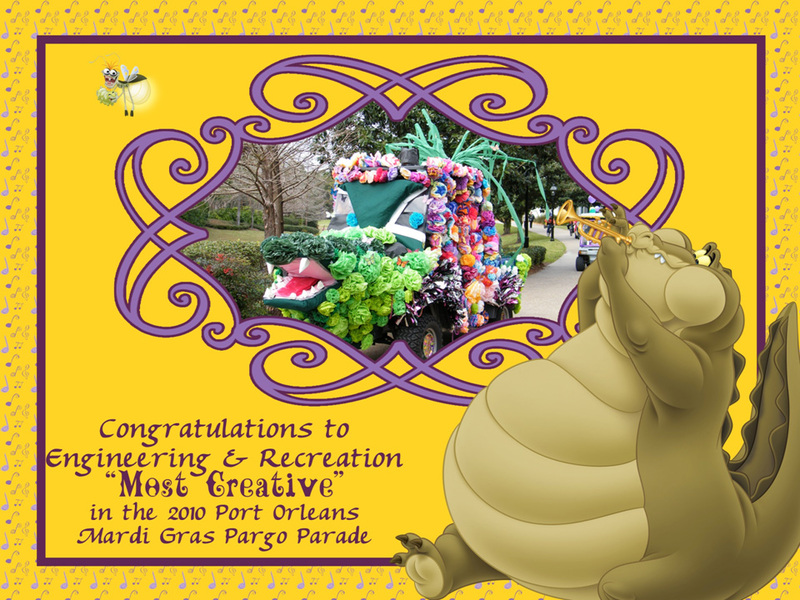 Thankfully the annual Mardi Gras ‘pargo parade’ put on by cast members did go ahead on Tuesday 9th February though, albeit on a somewhat smaller scale than in previous years. 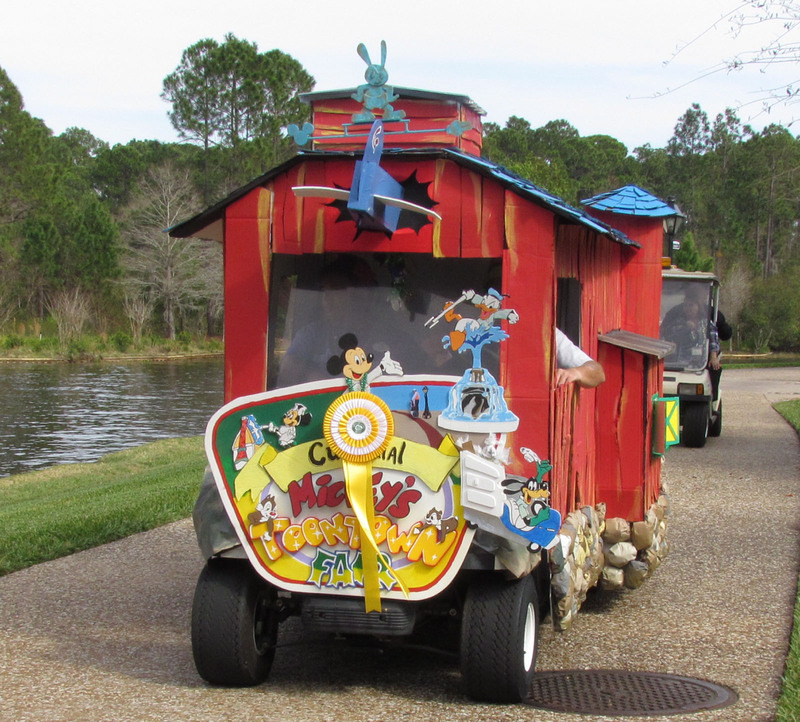 The theme was "Candyland", but only six instead of the usual ten pargos were used. 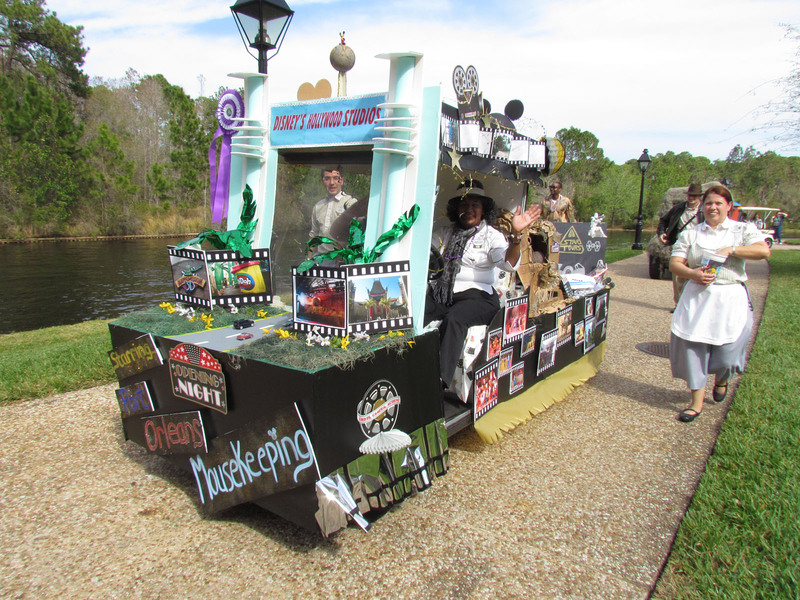 The different lines of business (Custodial / Engineering / Food & Beverage / Front Desk / Housekeeping / Merchandise / Operations Learning & Development / Recreation / Watercraft Transportation / etc) were combined to create the floats. 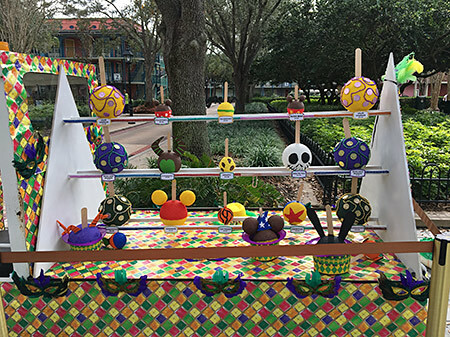 This year’s parade was held on Tuesday 13 February, and the theme was Walt Disney World Sweets and Treats (Dole Whip Float anyone?). 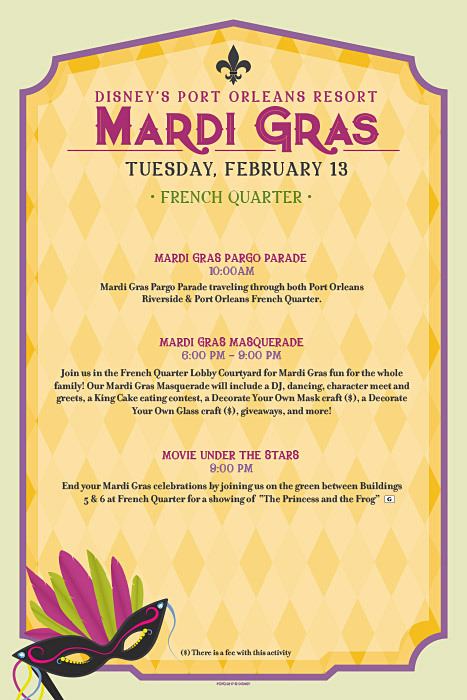 There was also a “Magical Mardi Gras” courtyard party at French Quarter for the whole family from 6pm—9pm. 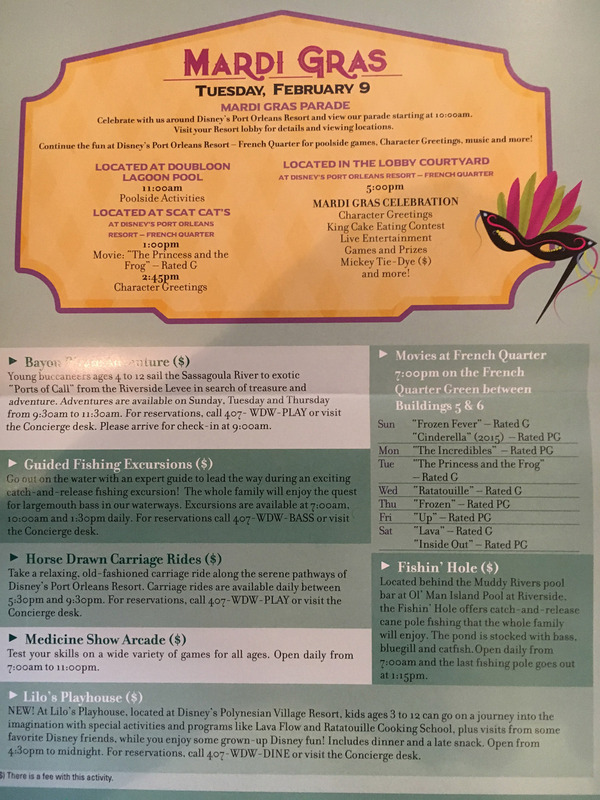 Celebrations included a DJ, dancing, character meet and greets, complimentary face painting, a King Cake eating contest, a Decorate Your Own Mask craft event ($), themed Name Works Keepsake Art ($), Balocoloc Venetian Masks available for purchase, giveaways, and more! 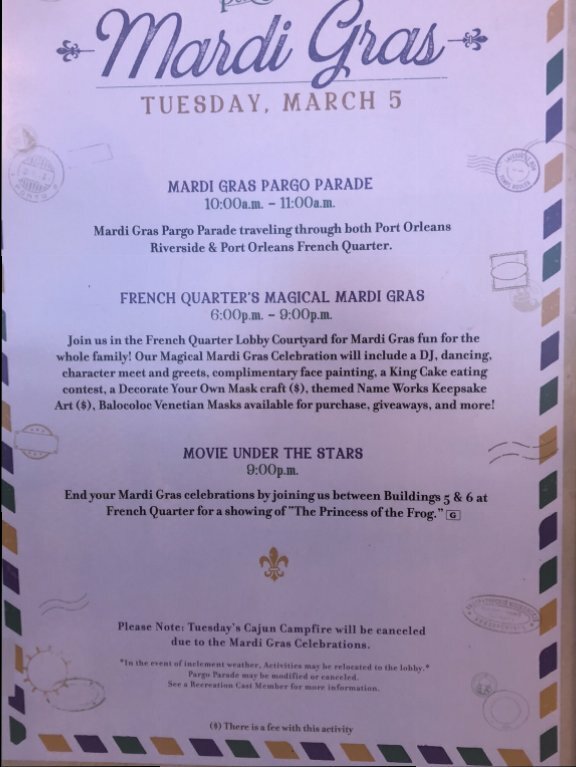 There was no Cajan Campfire in the evening due to the other celebrations taking place, but the Movie Under the Stars at 9pm was of course Disney’s New Orleans themed The Princess and the Frog.